Since this is all new to me, I decided to start with the black pair first. 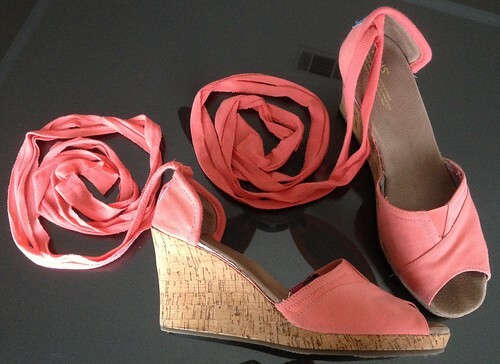 I have tons of black shoes, but only one pair of coral shoes. I grabbed my super-sharp craft knife and carefully cut away the sides of each shoe, following the seam lines around the heel and toe. I did a quick finger check. Yep, still ten. Excellent. 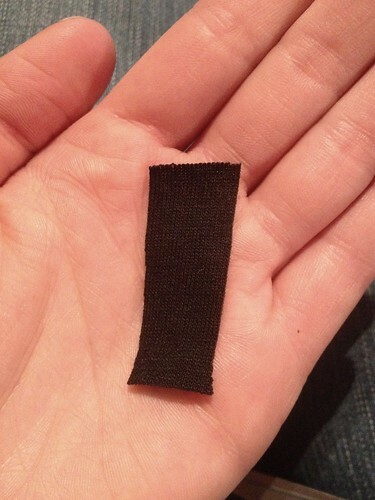 Then I grabbed some black knit fabric from my stash (remnants from the black t-shirt used in this project), and cut several 1.5-inch wide strips. I used some of one strips to bind the edges around the heel. 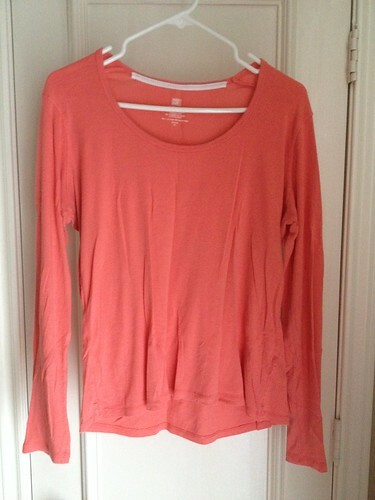 This was a hand-sewing-only kind of job, and boy did it stink! I poked a hole in my ghetto little plastic thimble with the "blunt" end of the needle, stabbing my finger in the process, and then I snapped the needle in two and had to go hunt up another. 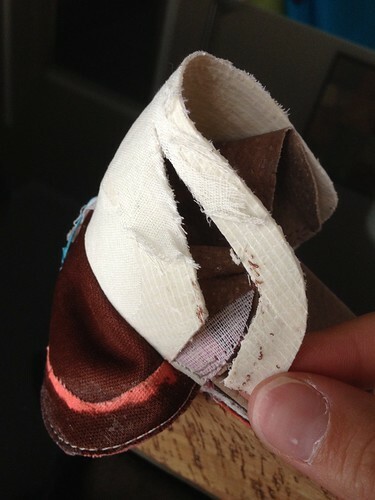 The plastic material that keeps the heel rigid also poses quite the challenge when stitching through it. I'll show you how I fixed that on the second pair in a minute. 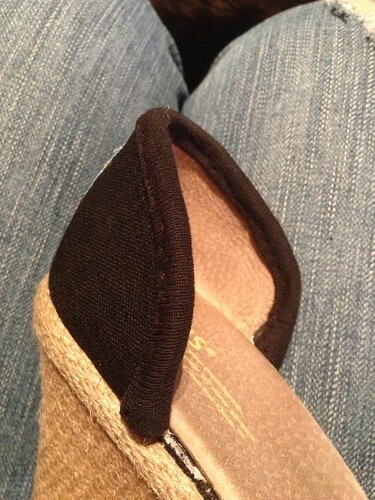 Folded in half and sewn to the back of the heel, this will hold my new ankle strap. 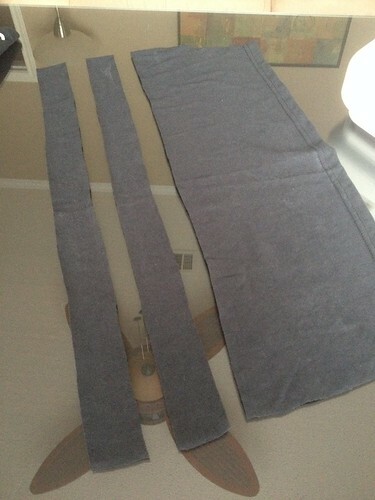 I took two of the t-shirt strips and joined them end-to-end, about 40 inches long. Then I stretched the crap out of it, and it grew to almost twice the length and rolled up on itself nicely to make a sort of cord. 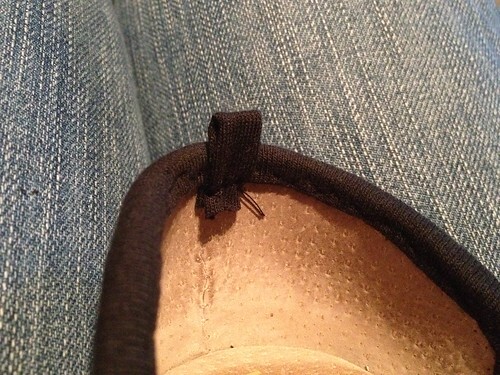 I threaded that through my little loop and repeated the whole process on shoe number two. Now I can wrap and tie those straps around my ankle as tightly as I like to keep the suckers on my heels. I feel like they look a bit more feminine and less sneaker-y as well, with the sides cut away. With the first pair successfully made over, it was time to address the coral pair. 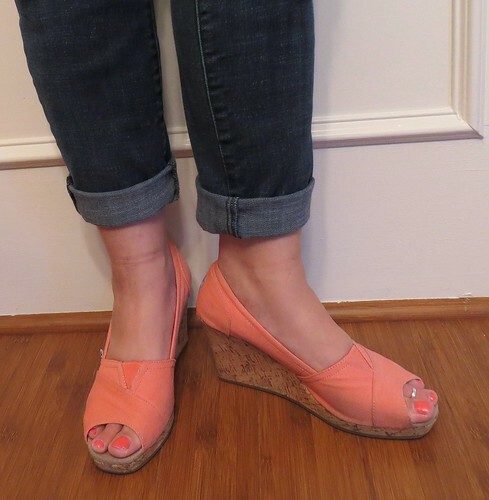 Luckily, I had the perfect colored tee in my refash stash to match the shoes almost exactly! I followed the same procedure as the first time, only now, before binding the edges of the heel, I peeled down the outer fabric and the lining to expose that hard plastic stiffener. Then I used my handy-dandy craft knife to remove about 1/2 inch all the way around. This will still keep the heel standing up, but won't be quite so difficult to sew through. Also, I didn't realize until I stretched out my straps to get them to roll up on themselves - this tee was made of ribbed knit fabric, rather than standard jersey fabric (stockinette stitch if you're a knitter). So they still stretched, but they didn't roll up. No biggie though - just a slightly different look. And again, just wrap those puppies around and around, and they aren't going anywhere! I'm so excited to be able to wear these again! I even played around with different ways to tie the straps. I'm not sure I have the legs to pull this off, but it's fun to experiment. 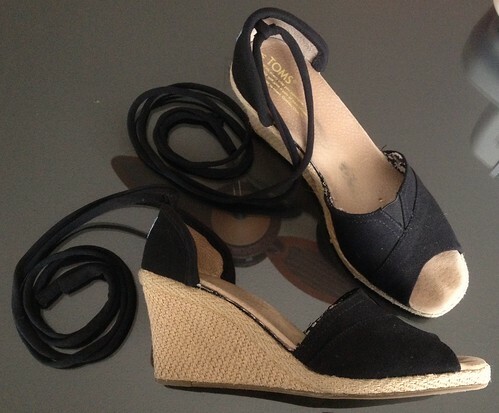 Great shoes refashion! Like them better now! This is such an interesting project!! Both pairs are nicely finished. I thought so too! It was great figuring stuff out along the way, like having to remove some of the plastic stuff in the heel.